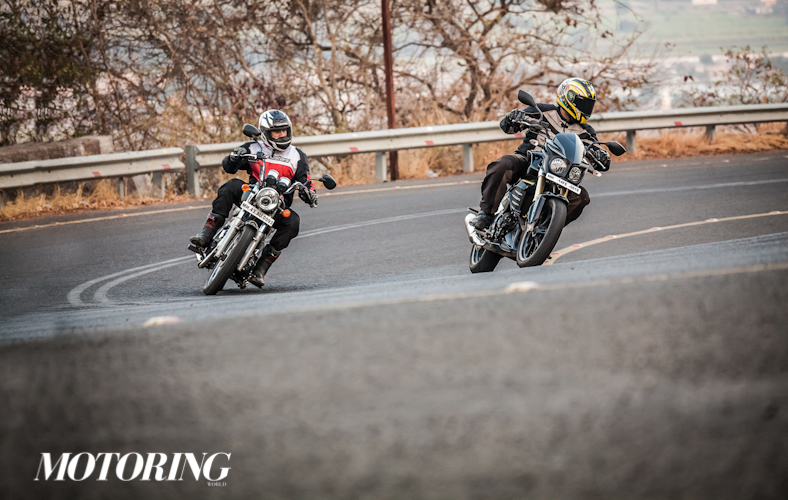 So while we wait for the new Royal Thunderbird X, here’s a little throwback to the story wherein we had the standard Thunderbird compared to a slightly modern competitor, the Mojo. It remains to be seen if the Thunderbird X can bridge the gap further. Meditation comes in many different forms. Not always do you need to be focussing on your breathing and contorting your body so manically that you start to resemble a human pretzel. Granted, living in today’s fast-paced world, peace of mind is more of a luxury than a necessity. But, as most of you motorcycle enthusiasts would agree, sometimes all you need is a nice sober ride into the distance to ease your troubled mind. The whole sense of adventure and exploring new places is what keeps a tourer’s mind ticking. Spending those long hours in the saddle is what creates a bond between man and machine. Does the motorcycle really matter? I don’t think so. But I do think the motorcycle shapes the whole experience; to some extent, it does influence your state of mind. 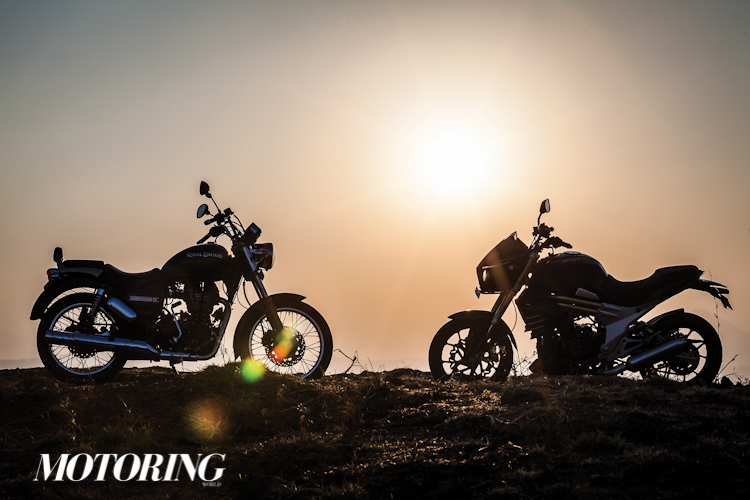 Royal Enfield has been producing touring motorcycles for decades now, while Mahindra has just entered the ball game. Can Mahindra’s fledgling really hold its ground against a touring veteran? Sometimes, change is what evolution and moving forward is all about. Other times, it’s simply the cause of extinction. Royal Enfield has stayed true to its retro-styling. The Thunderbird 500 boasts minimal use of fiber body panels. Because who needs fiber when you’re potentially riding a boat on two wheels. It still uses a bulbous metal tank and metal fenders with tasteful dashes of chrome scattered all over the place. The headlight remains round but now houses a projector setup for low beam and a circular LED-strip for its pilot lights. Okay, so maybe not everything needs to be from the 1950s. 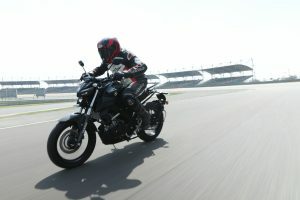 The motorcycle retains a cruiser stance with its signature low-set seat and raised handlebars. Royal Enfield has finally thrown in split seats; with a nice plush seat for the rider and a backrest for the pillion. This would also give the pillion the freedom to take occasional power-naps on longer rides, although a few well placed bungee cords might allow for more restful slumber. The meters remain analogue but now sport a digital read-out for average speed, average fuel consumption, two trip meters and a fuel gauge. The Mojo on the other hand is all kinds of swanky. Not a hint of retro in it, except for maybe the rather awkward-looking twin round headlamps. These are flanked by rather purposeful looking LED strips for pilot lights. Who knows, the Mojo could be the inspiration for a new character in the next edition of Angry Birds. The headlight cowl looks meaty and well chiselled. As does the tank, with the Mojo’s bulky twin ribs peeking out from beneath it. 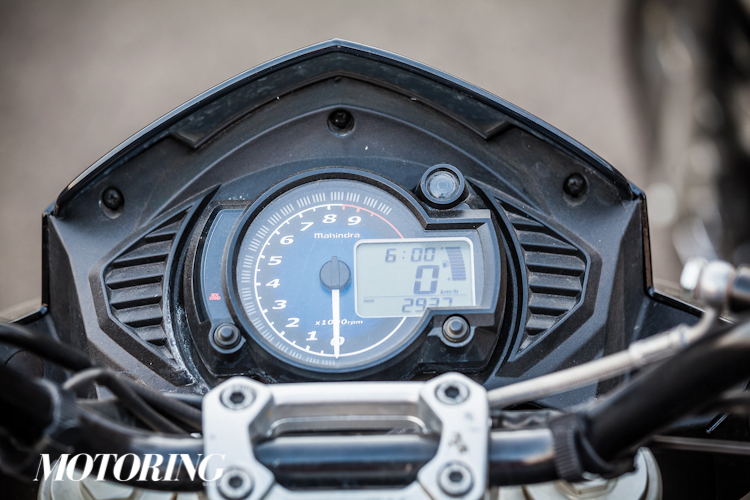 The speedometer cluster houses an analogue tachometer with a digital readout for speed, two trip meters, a fuel gauge and it even records your top speed. I think Mahindra may have swayed from the whole definition of touring; but who cares, now you can compete with yourself every time you throw a leg over the saddle. Fresh cup of narcissism, anyone? The tail section, on the other hand, seems to look rather disconnected from the rest of the motorcycle. No meatiness here, just a dainty little rear fender that juts out of the rear seat. And no matter how chunky that rear seat looks, its position in relation to the footpegs just does not add up. Forget about power-naps on the Mojo; out here the pillion would probably be holding on for dear life. One thing both these motorcycles have in common is that the footpegs are too far forward. 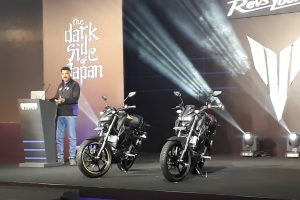 Now, Royal Enfield has the excuse of the Thunderbird 500 being a cruiser-styled motorcycle. I have no idea what Mahindra’s rationalisation is. Maybe Mahindra thought riding the Mojo would eventually turn out to be good skiing practice. You know, because just riding a motorcycle is probably not adventurous enough. 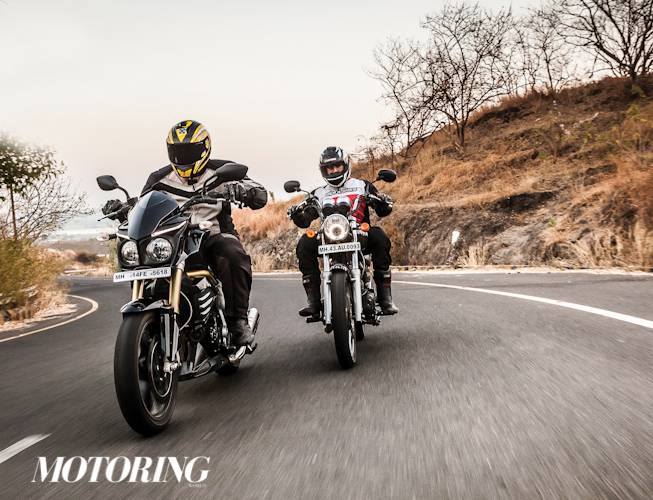 Nevertheless, both motorcycles have a relatively relaxed riding position that should help during those long hours in the saddle. Astride the Thunderbird, unless you qualify to be one of the Globe Trotters, you tend to move forward in the seat after riding for a while. This could be due to the aforementioned forward-set foot-pegs. Both have handlebars that keep the riding position relatively upright, which keeps your wrists and shoulders relatively relaxed. The Mojo’s switches feel well designed and rather premium. The Thunderbird, on the other hand, gets the standard switches found on all Royal Enfield models. It’s not that they lack quality in any way, but they do miss out on that premium feel. And let’s not forget that nestled between those meters is a tiny little button for parking lights, in case you start to miss the whole festive feeling of Diwali. 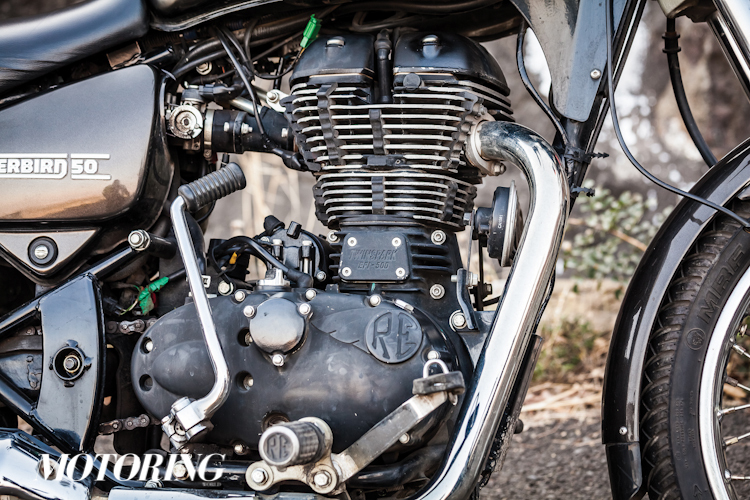 With the Thunderbird 500, Royal Enfield seems to have come eons ahead in terms of refinement. The engine now feels smooth and overall vibrations have been reduced drastically in comparison to the older models. 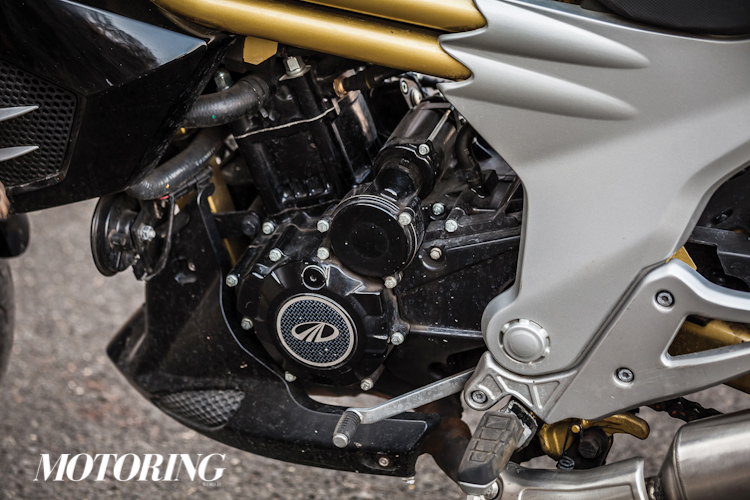 The suspension setup, though on the plusher side, is confidence inspiring at high speeds. With the older front suspension setup, attempt triple digit speeds and you’d almost be wrestling with the motorcycle to keep yourself and the motorcycle from merging with the surrounding foliage. The Thunderbird 500, in comparison, feels flickable and easy to manoeuvre. What is missing on this motorcycle is the signature Royal Enfield thump. Muffled into oblivion, at higher revs the air filter seems to be more vocal than the exhaust note. The Unit Construction Engine that we have here produces a decent amount of power and is now more reliable and refined, which translates to more time on the road and less time at your mechanic’s workshop; sipping on a cup of chai while he’s secretly becoming a millionaire from all the maintenance your Royal Enfield requires. When it comes to the Mojo, Mahindra has thrown in some pretty good quality suspension. 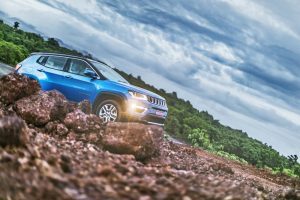 At lower speeds, the suspension feels pliant and handles bad roads relatively well. At higher speeds, the suspension stiffens up and allows you to hold lines better. Where the Mojo tends to fall behind is flickability. It tends to be a bit on the sluggish side and doesn’t seem overly enthusiastic when it sees a set of corners. Another great worry when cornering is those twin silencers. Sure, they do have that lovely raspy note, but enter a corner and you’d be more afraid of the silencers scraping the tarmac before your footpegs do. A bit of a waste, given that the Mojo comes with these excellent Pirelli Diablo Rosso II tyres. The edges of the tyre seem like they’re almost begging to be used. Oh well, maybe a nice candle-lit dinner sometime might help. The actual gem in the Mojo is its engine. Mahindra has done a wonderful job with refinement and power, and those four valves keep things always running smooth. Peak torque kicks in at around 5500 rpm and from then on the Mojo really moves. And even though the power figures of the Mojo and Thunderbird are almost the same, the Mojo feels like it puts down a lot more. Despite the fact that these are both excellent motorcycles for exploring the countryside, I’d have to say the Thunderbird 500 just makes the whole experience that little bit better. 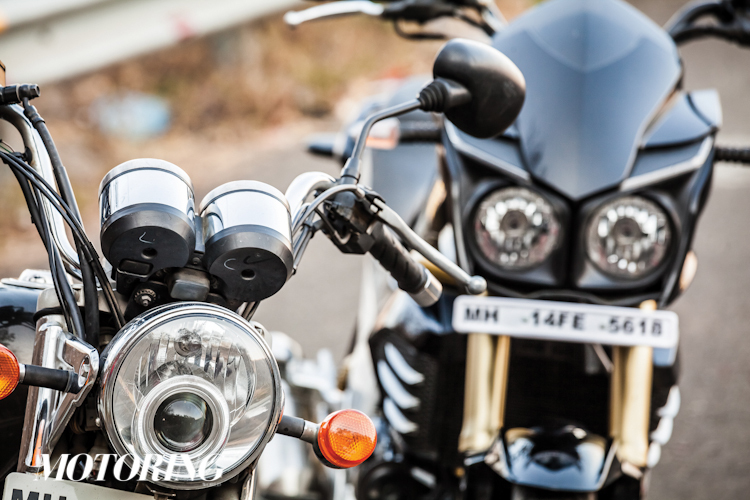 Like a typical Royal Enfield, it gets you into a sort of rhythm. It just smoothens out bad roads so well. And despite its cruiser-styled setup, the tyres actually make the occasional stretch of dirt riding seem quite possible. The Mojo, on the other hand, wants to wash out at the slightest sign of dirt. There seems to be just too much weight on the front tyre. A little bit of hard braking with the rear brake and you’d be sliding around, probably because there doesn’t seem to be much weight on the rear end. The lack of ABS doesn’t seem to help here. Where the Mojo does come to life is when you’re really pushing it. But then again, for long distance touring that’s not something you’d want to be doing all day. The Mojo is a great motorcycle with excellent parts all over, I just wish those parts would all come together a little better than they do. Because at the end of the day, while you’re watching a beautiful sunset in whatever part of the country you land up, I just feel you’d be that one step closer to inner peace if the Thunderbird was your chariot for the day. Then again, I also think skiing down a slope with an avalanche in pursuit seems cool, so what do I know? All prices have been updated. The story was originally published in February 2016. 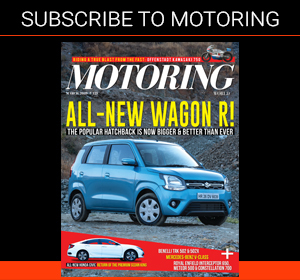 For more information about the latest cars and bikes, please have a look at our news section.